Halloween is a super fun holiday for kids, but you want to make sure it's fun holiday, too. Take these safety proecautions when choosing (or making) your child's Halloween costume for a night of strictly fun frights. These tips can help. When choosing a costume, be sure it is flame resistant. While flame resistant doesn’t mean a costume can’t catch on fire, it does mean it will resist burning. Wigs and other accessories should also be flame resistant. Look at the labels before purchasing costumes or fabrics to determine if they are flame resistant. Be sure the costume fits well. Oversized costumes with extra hanging fabric can pose tripping hazards and provide opportunities for the costume to gets caught on things like stair railings, tree branches and bushes. Select costumes that can be seen during dusk and darkness. If the costume you choose provides for no visibility, add reflective tape to it (available at hardware stores). 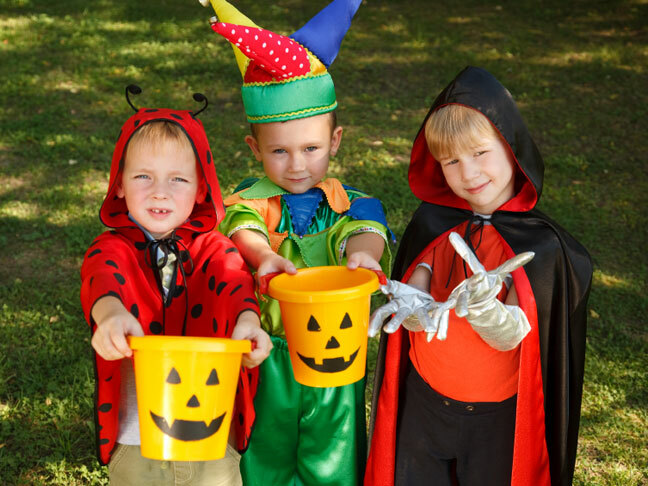 Trick-or-treating bags and sacks should also be trimmed with reflective tape for added visibility. Having your child carry a flashlight in his treat bag will help him be seen and see more easily. Even if your kids don't trick-or-treat in the dark, carrying a flashlight (with fresh batteries) is always a smart safety idea. Have your child wear her everyday shoes with her costume. Dress up shoes and costume footwear are not typically the safest options for walking around outside in the dark, so select choose that are suited to lots of walking. Your child can always jazz them up with stick-on-gems, paint, and stickers to make the shoes more festive. Ill-fitting Halloween masks can obscure vision and even restrict breathing. If you choose to use a mask, be sure the eye holes are big enough to ensure a full line of sight. If you are using a scarf, be sure it is tied well so that it won’t fall over your child’s eyes, nose or mouth. Be sure swords, knives and other accessories are made of soft, flexible material rather than hard plastic. If your child falls, a soft accessory will be less likely to cause injury. Maximize your Halloween fun and minimize your child’s chance of injury by choosing the safest Halloween costume possible. How do you ensure Halloween costume safety? We’d love to hear about it. Share your tips in the comments below.